The receipt is still crisp and clear after fifty-eight years. "Received from Mrs. G.E. Hicks, $l50.00 for one bay horse." Signed, "Edna Burgoyne, Oct 19, 1946." My sister and I puzzled over that receipt when she unearthed it recently from a trove of family documents. Wasn’t $l50.00 a lot of money for a horse of any colour in the B.C. Interior in 1946? And, didn’t men usually transact business? I investigated further. In May 1946 our family boarded the CNR at Kingston, Ontario, headed for our cabin in B.C. We’d spent the war years in Deseronto, Ontario, while my father worked at an aircraft plant in Kingston. The list of household effects being shipped to B.C. included a stove, tent, mattress, bed-spring, crib, saw, shovel and axe. But, no horse. When we arrived in Valemount at the end of May, the first item of business was to plant a garden and raise food to see us through the winter. We had to hire John Hunter and his horses to plow the ground. The garden was only one problem. There was land to be cleared, supplies to be hauled, a growing family to be transported. Clearly we needed a horse of our own. Edna Burgoyne’s husband, Fred, had died in the spring of 1946. By autumn she realized she was not going to be able to work with the horse, so in October, she sold it to my mother. I assume Mother cashed in war bonds to purchase Toots, the bay horse. She never made a better investment. Toots wasn’t a specialist. Like so many frontier horses, she was an all-purpose equine. She could chase a cow with the best if there was any need, but she had many skills. Was there logging to be done? Toots was your horse. Clearing land, pulling out stumps or hauling the stone boat? Call for Toots. Carrying hay for winter feed for herself and the cow? Hitch her up and watch her go. She dragged trimmed logs from the woods for our new house, conveyed uncounted bags of chicken feed home from the store as well as bringing the small chicks themselves when they arrived from the hatchery. For our family, two miles from the nearest town, a horse made life much easier. Toots could move almost any conveyance from the high-wheeled cart or low stone boat, to the snappy winter cutter. A child’s idea of fun was standing on the back runners as the horse galloped along through heavy snow. The best SUV’s can’t compare. Toots was a tall, imposing horse, but she was remarkably patient with children. Small as we were, we could walk under her, snuggle up against a foreleg or climb on her back for a ride, always in perfect safety. She had ideas of her own, though, which didn’t always coincide with what Father wanted her to do. I can still recall the sound of snapping tree branches and splintered cart sides as Toots made her own path through the woods, not one whit restrained by Father’s yelled epithets. (Father never swore but no one put more feeling into a loud "Confound it!") His cries were all the more emotional because he had hand-built that cart and would have to repair it. Eventually the horse would stop, they’d make up and work harmoniously together again. It’s impossible for anyone raised with only motor vehicles as transportation to realize the freedom and mobility that came with acquiring horses. Whether berry picking, camping or hunting, there is a great difference between the distance human feet can travel and the load human backs can carry compared to the strength and speed of a horse. 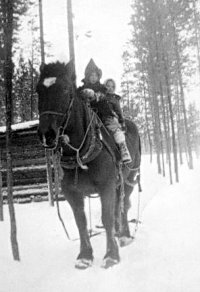 For several years my father logged on mountains south of the small settlement of Albreda, twenty-five miles from Valemount. Today it’s a half-hour drive on a good highway. Then it was a long day’s trek for one horse pulling a cart laden with family, food, and tools over dirt tracks which could not honestly be called roads. There was so little traffic that, when a pan containing a cake Mother had baked at home fell out onto the trail in our outward trip, it lay there undisturbed in the dust till we returned two weeks later. Explorers Milton and Cheadle passed that way in 1863. The Overlanders went by headed for Kamloops in 1862. Not much had happened since. We built a rough cabin on a small rise and lived there all summer. The mountain, with its untouched fir and spruce woods and some of the world’s tallest, toughest devil’s club rose just behind the cabin. Every day Father and Toots set off to locate, cut down and haul out the best trees. More threatening creatures than devil’s club haunted those hills. Cougar roamed there; we often heard them calling. 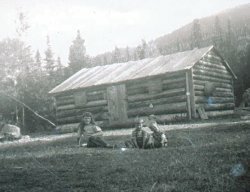 Toots must have felt vulnerable, even though her shelter was near the cabin. Only once did she roll her eyes, lay her ears back and refuse to go further up the mountain. Father respected her anxiety. They turned back and went to a different area. Life wasn’t all work, of course. The horse transported us to card parties, Saturday night dances, Xmas concerts and school picnics. Toots got to hobnob with fellow horses. We had the fun of driving home at night, tucked under a blanket, staring sleepily up at the stars. In both work or fun, Toots played a prominent part. In return, she had a big, warm, dry barn filled with heavy-scented hay, sunshine to frolic in, clear streams to drink from, places to roll and people who never forgot how much they needed her. Toots was certainly one of the most important members of the family. Keeping her healthy and in good condition was vital. Even when my brother and I went the half mile to the river to chop open a water hole in the ice for her before we went to school, we did it without complaining. Not that we got to ride to school No, that was for more favoured children whose families had several horses. We could walk the two miles. Toots, we knew, was reserved for much more serious tasks. That’s why we were so frightened one summer afternoon when we heard a terrified, gurgling, neighing sound coming from the river. Father was away working. Mother, three small children behind her, ran to the river and stared in dismay at the horse. Toots had leaned over for a drink as usual but the bank collapsed and she plunged into a pool so deep she couldn’t touch bottom. Nor could she get a hoof on the steep sides to climb out. A large fallen tree blocked her from swimming to the shallow ground on the other side of the river. Mother acted decisively. She tried to hold Toot’s head above water while talking to calm the frantic horse. My two brothers were told to stay well back. I was instructed to run to the neighbour’s for help. The nearest neighbour was over a mile away. Off I went, up two hills, across the Cranberry Creek bridge and through the pine woods, desperately hoping to make it to Bigelow’s before the horse drowned. When I gasped out my story Keith Bigelow wasted no time saddling his horse and riding rapidly to the rescue. I walked back, puffing anxiously, behind them. It ended well. Keith roped Toots and pulled her from her watery prison. We stood round the two horses patting and praising them. Our valuable horse was safe. Eventually, inevitably we bought a car, then a tractor. We kept Toots, though. And we kept a deep feeling for horses; those loyal, hard-working creatures, our helpers and companions.